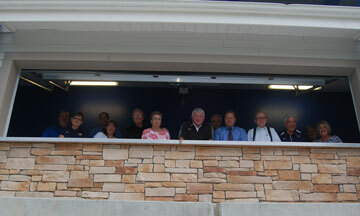 University President Dr. Tim Barry hosted the Chamber in the President’s Box of the university’s multi-purpose sports stadium prior to men’s and women’s soccer matches with teams from Kentucky Wesleyan University. Refreshments were catered by SODEXO while visitors were invited to tour the sports complex. The next regular meeting of the Chamber is scheduled over lunch at the Medallion Restaurant on Thursday, October 4th, when Al Schopp, Vice President of Antero Resources, will discuss the current and future prospects for the oil and gas industry in Barbour County.